Oh, by the way, if you're coming from Kim and Lacey's blog at Styled With Lace, let me welcome you! If you didn't know, my post is part of a blog hop where a bunch of us home decor bloggers are showing you how we use plants and flowers in our home decor. Perfect for Spring time, right? At the end of this post you will see a list of all participating blogs. I ABSOLUTELY LOVE how plants look in a room. Houseplants immediately freshen up a space and make it more inviting and "homey". But I am horrible at keeping them alive. HO-RI-BBLE. (Please tell me you can relate). I'm going to tell you my good experiences and bad experiences when it comes to my houseplants. We can learn from this together, OK?! Let me start by reviewing my houseplants from the most recently purchased to the oldest. I will be reviewing 7 with you today. These beauties grow to be pretty tall, and to me they resemble a forest of trees. I think this is one of the most beautiful plants I have ever seen. False Aralia like to be near a sunny window, but not too sunny (what the heck does that even mean) and should be watered once the top of the soil is dry. Also, they don't like to be moved. My False Aralia plants (I got two for the bedroom) were thriving the first two weeks! I was so happy! Then I noticed that one of the plants was infested with gnats. Ugh. So I made some dumb gnat trap by filling a bowl with dish soap and apple cider vinegar. It's supposed to attract the gnats. Like the gnats are supposed to be like "oh, what's that yummy smell? Let me check!" then fly in the bowl, drown in the liquid and die. Like, do gnats even have noses?! I left the bowl next to the plant for 48 hours. I caught two gnats. Two. 😒 Then I decided to try out a spray. I bought some dumb spray that kills pests (safe for indoors) and nope, didn't work. And the other one is half- dead. So what is the lesson learned? Do not buy plants with gnats. There's no easy way of getting rid of them and they will end up killing your plants. By the way... I bought these at Lowes and I know they will exchange the plants but they currently don't have any False Aralia so I'm patiently waiting for them to get more. So, what is my rating on the False Aralia? 2 out of 3 stars. I would recommend it -without the bugs. These big beauties usually are pretty inexpensive. Most I have seen have been less than $16. I have owned this Majesty Palm for about two months and I see that new leaves are sprouting so I'm very happy with it. I water it about every 6 days or when the top of the soil is a little dry to the touch. It gets indirect sunlight for most of the day. It seems happy! My parents also have a Majesty Palm in their living room and they have had it for a few years. I have a feeling this palm will last me a while as long as I don't neglect it. My rating for the Majesty Palm? 3 out of 3 stars. I would definitely recommend it in a well-lit space. Succulents are known for their resilience. They are easy to care for and require little watering. AWESOME! Sounds like my kind of plant! The little succulent on the right is real, the big one on the left is fake. Just an FYI. I happily purchased my little baby succulent and it went on my coffee table. My living room gets bright sunlight in the morning so I figured it would be happy there. I only watered my baby succulent when the soil would get dry and all was good. Until I decided to move it. I moved my baby succulent to the side table and it got all freaked out! The leaves started to shrivel, so I watered it.. I mean, what else does one do when a plant looks shriveled? Perform CPR on it or something? Now, I don't hate all succulents. This hanging succulent called "String Of Bananas" has lasted me YEARS. Want to know the secret...? Fake succulents are the succulents I love. Actually, there used to be a real String of Bananas in there but it started to die after a few months so I added some fake stems to it. You can still see some dead strings hanging there. I left them because they make the plant look more realistic hahahaha! So what did I learn? Keep your succulents in one spot and make it a good one! Plus, DO NOT overwater them. Let the soil dry out before adding just a bit of water. My rating for succulents: 1 out of 3 stars. Sorry. I love the way succulents look but I have gone through 4 of them and I still can't figure them out. I don't recommend them for those who have black thumbs like I do. I have owned this beauty for almost a year and it's still alive! Dracaena loves bright, but indirect light. It can tolerate little water so if you forget to water it, it will be fine. I had neglected it for a few weeks (months) and it still thrived! Some of the leaves of my Dracaena have browned at the edges because it got too much direct sun and that burns the leaves. I have to move my Dracaena away from the window a bit during the Spring and Summer months when my living room gets a lot of sun. But still, it's in great shape. What have I learned? Dracaena is easy to care for and needs little attention. Water once a week and avoid watering the leaves and stems or they can rot. Keep away from direct sunlight. My rating for Dracaena is 3 out of 3 stars. I highly recommend it! So, this magical plant is supposed to be lucky and bring lots of money. I'm not sure about all that, but I can tell you that I have owned this Money Tree plant for about 2 years and its doing OK! I had my money tree outside on my patio and the leaves started to turn yellow. Later, I found out that Money Trees like shady, but bright areas. I moved it to the corner of my covered porch and saved it's life. It was alive, but it didn't grow much. Recently I decided to move my money tree indoors to my dining room and since then started sprouting big, beautiful green leaves! I'm super happy! What did I learn? Money Trees like indirect light so they make great indoor plants. They are not fussy and easy to care for and can adapt to change pretty well. Water every 10 days or so. My rating for a Money Tree plant: 3 out of 3 stars. I would definitely recommend one. So then I moved it to my son's bedroom in hopes that it will like it there. I think it just needs regular watering and plenty of sunlight. Don't worry, I'm going to bring it back to life, you'll see! What did I learn? That Snake Plants are super easy to care for, but still, you can't just NOT water them! They like bright spaces. When you do water them, water the soil around them and avoid getting the leaves wet or the leaves may rot. My rating for Snake Plants is 3 out of 3 stars. I definitely recommend them. I have owned two Fiddle Leaf Fig trees. They both started great, sprouting huge, healthy leaves then for no reason, just died. And I took it very personally. Fiddle Leaf Figs are known to be high maintenance and AIN'T NOBODY GOT TIME FOR DAT! I don't even have a picture to show you of my Fiddle Leaf Figs. I'm sure you have all seen them anyway. 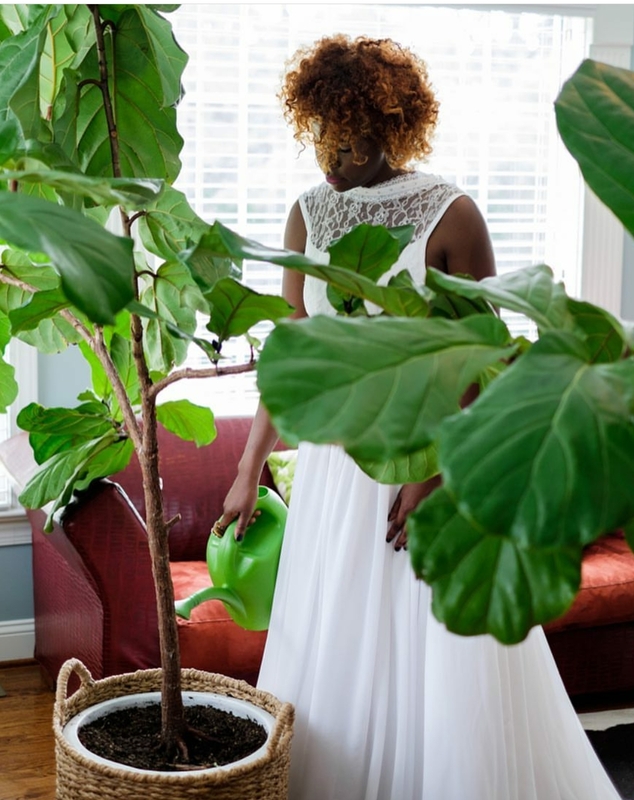 Here is a picture of my friend Stacey over at Design Addict Mom watering her AMAZING Fiddle Leaf figs! I am so JELLY! My rating for Fiddle Leaf Figs? 1 out of 3 stars. NEXT, it's time to go to the next blog to get ideas on decorating with plants and flowers. This is the best I have seen in a long time! I totally loved your honesty and I must say I laughed at your sad plants. I have been there with many a house plants. Are you sure you want another one of those plants from Lowes? They probably are prone to attracting bugs? Ivy is definitely an aphid attractor. I have two fiddle leaf figs and I found that when I over watered them they got bugs. So, now I place my finger down deep into the soil and if it is totally dry, I water it. Mine are happy as clams and I move them everywhere in our home. I usually don't have them in photos so that's why they get moved. Good luck with all your happy plants, I always feel like my home is more of a plant hospital! I have a fee plants that need to check into your plant hospital lol! This plant care is hard! Phew! To answer your question about my plants from Lowe's, yes I definitely want to get the same ones again because they are so beautiful! I just have to make sure that there's no bugs in them. Thanks for reading! Oscar you crack me up! That snake plant!! Haha!! This was such a great post! So helpful and informative....faux real! 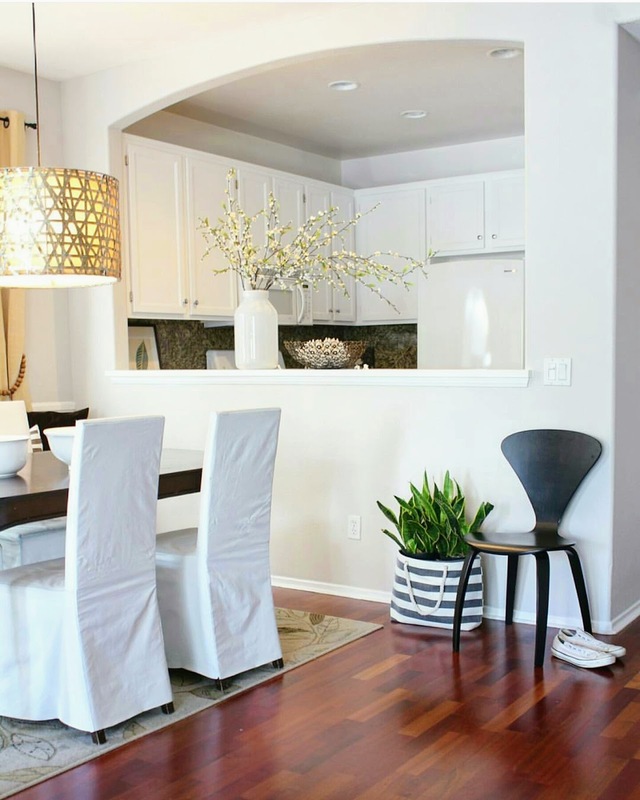 ;-) I love the way you've chosen and styled all the plants in your home! Thanks Summer! Sometimes the best way to overcome frustration is with laughter lol. You cracked me up with this one, Oscar - loved it!! I loved learning from your experience (hopefully it will keep me from making the same mistakes!) I have a fiddle leaf that I have managed to keep alive for 2 years now. I know - I can't believe it myself!! And my MIL tongue is looking sad now - which is really awful since they are so easy to keep alive! Lol Tamara you give me way too much credit hahaha! Thanks but I'm still intimidated by real plants and I never think they are going to last me. Oh well, there's some great looking faux plants out there, right!? Oscar, you are a man after my own heart for sure! I don't even do house plants at all because A) I either kill them or, B) they bring bugs!! But I love the look of them and I know they are good for the inside air as well. You have inspired me with this very informative (and funny!) post and I'm thinking I should try one of the ones you have succeeded with. And by the way, all my succulents have died too, haha! Oh Oscar..I love this post! I learned so much. Sorry about the dead plants. I can definitely relate! I have been wanting to get a big plant for a corner in my home...thanks for helping me with ideas!